President Kenneth Kaunda on Tuesday called for peace as he cast his ballot in elections marred by rioting. "We must continue with the peace and democracy," the 87-year-old said. 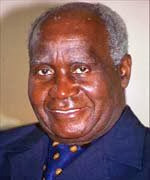 Kaunda ruled Zambia from independence in 1964 to 1991, when he lost to the late Frederick Chiluba in the first multiparty elections.